Four years ago, I thought I was a much better fantasy player than I actually was. I would dominate my leagues against weaker competition (mostly friends and family who would over-draft players on their favorite teams) and build stacked rosters where my bench was arguably stronger than most teams’ starters. I knew I was an amazing drafter, but I had one glaring weak-spot – I sucked at making start/sit decision each week. Although consulting PFF’s expert rankings was the obvious shortcut I was neglecting, it wasn’t until I started playing DFS that I became much better at making my start/sit decisions. Too often I neglected poor matchups, injuries, Vegas lines, or inclement weather. I subscribed to the age-old adage of “start your studs,” forever afraid of getting “too cute” with players on my bench. Once I started treating my starting lineup like a DFS roster, and was unafraid of being too bold, I had much more success on a week-to-week basis. Of course, I’m still not benching my second-round wide receiver in a perceived poor matchup, this was a major turning point in my fantasy career. With this in mind, I’m here to help you out with some of your more questionable calls for your season-long teams. If you’re ever stuck between a few players, please feel free to reach out to me on twitter (@ScottBarrettDFB) early in the week, and I’ll try to do my best to fit them into that week’s column. Here were some of your most frequently mentioned players for Week 1. 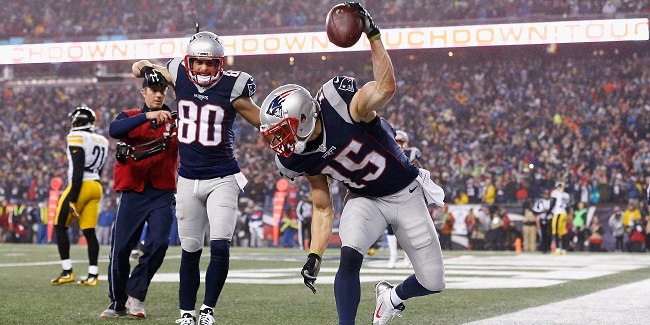 Chris Hogan, WR, New England Patriots (vs. KC) – If you drafted Hogan prior to Julian Edelman’s injury, congratulations, you struck gold. If you drafted him after Edelman’s injury, you’re still looking pretty, as his ADP never came close to as high as where he was sitting in my rankings. Hogan was Tom Brady‘s favorite target this preseason, drawing six targets on 23 attempts. Julian Edelman was next-closest with four. Hogan will likely run more routes from the slot this week and this season in Edelman’s absence. Kansas City will be without their starting slot cornerback (Steve Nelson) this week. Likely starting slot cornerback Phillip Gaines allowed 209 yards into his coverage the last time he played more than 13 snaps. For perspective, this was the fifth-most yards any cornerback has surrendered in a single game this past decade. Of 101 qualifying cornerbacks, he allowed the fifth-most fantasy points per route in coverage. Hogan is an easy-start this week with Vegas projecting New England drops 28.75 points on the Chiefs — the highest implied point total of the week. Kareem Hunt, RB, Kansas City Chiefs (at NE) – Hunt undoubtedly draws a tough matchup this week against a New England defense that allowed the eighth-fewest fantasy points per game to opposing running backs last season. Hunt also has the drawback of projected negative gamescript (nine-point underdogs) and a low Vegas implied point total (sixth-lowest). Still, Hunt has one thing working to his advantage — a healthy workload as the team’s featured back. Over Reid’s last 13 seasons as a head coach, his featured running back has averaged 19.5 fantasy points per game and 20.8 opportunities per game. The Patriots did allow the fourth-most receiving fantasy points per game to opposing running backs, and Hunt appeared more than capable as a pass-catcher in college. He ranked fifth-best in yards per target, ninth-best in yards per route run, and third-best in missed tackles forced per reception last season. Hunt is an every-week starter for me until proven otherwise. Alshon Jeffery, WR, Philadelphia Eagles (at WAS) – Over the past three seasons, Redskins cornerback Josh Norman ranks second-best in opposing passer rating (61.0) and yards allowed per route in coverage (0.81). We know Norman will be shadowing this season against top wide receivers. You just spent a fourth-round pick on Jeffery and now you’re wondering what to do with him in Week 1. Although Norman might be the best cornerback in the league, no wide receiver matches up better against him than Jeffery. Jeffery’s three-best routes (crossing routes, ins, and comebacks) are Norman’s three-worst routes. On nine targets, Jeffery averages 12.1 yards per target against Norman, which is the best of any wide receiver to see at least five targets against Norman over the past three seasons (next-closest is Odell Beckham with 7.7). Jeffery is undoubtedly still a risky play in DFS, but in season-long leagues, Jeffery is still a fine play. Kendall Wright, WR, Chicago Bears (vs. ATL) – Although Falcons’ slot cornerback Brian Poole was impressive last season, the Falcons still allowed the third-most fantasy points per game to opposing wide receivers out of the slot last year. Wright hit career highs in targets (139) and receiving yards (1,079) in 2013 with Dowell Loggains (current offensive coordinator with the Bears). Throughout the rest of his career, Wright’s career highs in targets and yards were only 104 and 715, respectively. With Alshon Jeffery in Philadelphia and Cameron Meredith out for the year, Chicago has 191 targets unaccounted for in this offense. With Atlanta favored by seven, the projected negative gamescript should mean Chicago will go pass-heavy in this contest. With Atlanta getting back a healthy Desmond Trufant, who graded out sixth-, 10th-, and 20th-best over the past three seasons, and likely shadowing Kevin White on the outside, Wright should see a large percentage of these missing targets in Week 1. Especially in PPR leagues, or if desperate, Wright is a fine flex play. Zay Jones, WR, Buffalo Bills (vs. NYJ) — Jones was one of my favorite targets in rookie drafts this offseason, and it’s looking like he’ll find his way onto some of my lineups this week. Buffalo traded up in the early second round to reunite Jones with his former wide receivers coach Phil McGeoghan, currently serving in the same position with the Bills. During Buffalo’s press conference immediately following the selection, Bills head coach Sean McDermott continually talked up the importance of completions to an offense and the importance of adding a dependable receiver. That’s exactly what Jones projects to be at the NFL level, and exactly what he was in college – a dependable possession wide receiver. Jones became the Division I single-season record-holder in receptions last season with 158, which was 21 more than the next-closest receiver last year. He also posted a 3.7 percent drop rate in 2016, which was the best rate among all drafted wide receivers. With Sammy Watkins in Los Angeles, Anquan Boldin retired, and Jordan Matthews either out or limited with a chip fracture in his sternum, Jones should be peppered with targets this week against a porous Jets secondary that allowed the 11th-most fantasy points per game to opposing outside wide receivers last season. Buffalo has the ninth-highest Vegas implied point total this week, and like Wright, is a fine play in PPR leagues or if desperate. Sammy Watkins, WR, Los Angeles Rams (vs. IND) – If you’re like me and chased Watkins elite talent and historic production levels prior to his trade to Los Angeles, you’re probably just as depressed as I am. As if catching passes from Jared Goff wasn’t bad enough, Watkins now has one of the toughest season-long cornerback schedules in the league. Fortunately for us, this week’s matchup isn’t one of those tough draws. The Colts will be without top corner Vontae Davis and safety Clayton Geathers. Watkins projects to run the majority of his routes against pedestrian veteran Rashaan Melvin and one of rookies Quincy Wilson and Nate Hairston. Indianapolis allowed the seventh-most fantasy points per game to outside wide receivers last season, and look even worse on paper this week. Although Goff’s apparent superior rapport with Cooper Kupp (who is a fine desperation flex play in his own right, nearly on-par with Wright and Jones) is a concern, I’m going to wait until after Week 1 before I really start to panic on Watkins. Jeremy Maclin/Mike Wallace, WRs, Baltimore Ravens (at CIN) – Although I had both receivers lower than my peers in season-long rankings, I’m optimistic for both regarding their Week 1 potential. Cincinnati will be without top cornerback Adam Jones and linebacker Vontaze Burfict this week. With tight end a massive question mark and Breshad Perriman missing each preseason game with a hamstring injury (questionable for Week 1), I see a heavy workload for both receivers. Both are borderline flex plays for me this week, despite a low implied point total. 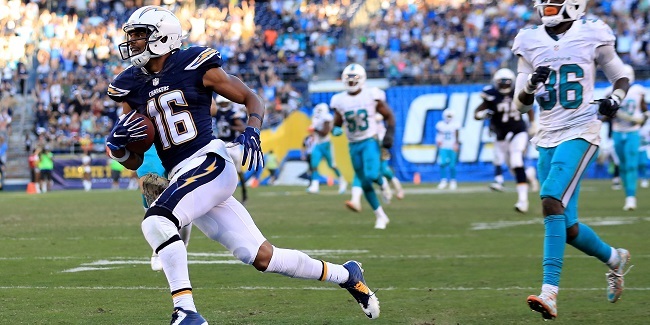 Tyrell Williams, WR, Los Angeles Chargers (at DEN) — Denver allowed only 13.8 fantasy points per game to opposing outside wide receivers last season, while the third-closest defense allowed 17.7 (24.8 percent more). Williams averaged only 3.6 fantasy points per game in two games against Denver last season, but 15.0 the rest of the time. For perspective, excluding those games would have pushed him up from 22nd in points per game at the position to 13th. Williams might be flex-worthy in season-long leagues as rookie Mike Williams remains out with a back injury, but he’s not in play this week. Jared Goff, QB, Los Angeles Rams (vs. IND) – As I mentioned earlier, the matchup is attractive for Los Angeles’ passing game, but it’s likely even more attractive for Todd Gurley with Andrew Luck out for Indianapolis. The projected positive gamescript (the Rams are favored by 3.5) — as well as the Colts ranking second-worst in running back yards per carry allowed last season – both bode well for Gurley. Confoundingly, Goff was one of my most-mentioned names in start/sit questions this week. Given how disastrously he played last season, I’m not playing Goff until he proves he’s not the colossal bust he looked last year. Tevin Coleman, RB, Atlanta Falcons (at CHI) – Few have been lower on Coleman or Devonta Freeman this offseason than I have. After losing offensive coordinator Kyle Shanahan this offseason, Atlanta appears destined for a massive regression they were already due for anyway after posting some historic efficiency numbers last year. I’m also not a fan of drafting running backs stuck in committees at ADPs as high as where Freeman or Coleman were going. The drop-off in efficiency will likely be massive for Coleman’s fantasy value, after ranking 37th in carries per game (9.1) and 28th in targets per game (3.1) last year. I can’t envision very many scenarios where Coleman is worth a start barring an injury to Freeman. T.Y. Hilton, WR, Indianapolis Colts (at LAR) — Over the past two seasons, Hilton averaged 16.3 points per game when Andrew Luck has been active, and 11.6 when he has not. Hilton runs 57 percent of his routes from the slot, and should spend the majority of the game against Rams’ slot cornerback Nickell Robey-Coleman. Robey-Coleman ranked 15th-best among 113 qualifying cornerbacks in fantasy points allowed per route in coverage last season. I still have Hilton as a high-end WR3 this week, but he’s worth benching if you’re deep at wide receiver. Joe Mixon, RB, Cincinnati Bengals (vs. BLT) – I absolutely have no question regarding Mixon’s talent. Of the first seven running backs drafted, looking at last year’s stats, Mixon ranked first in yards per carry, second in yards after contact per attempt, third in missed tackles forced per attempt, first in yards per route run, first in yards per target, first in yards after the catch per reception, and second in pass-blocking efficiency. However, I do question his volume in Week 1. I see him surpassing Jeremy Hill, who ranks last in yards per carry over the past two seasons, at some point this season. Mixon was also our highest-graded running back as a receiver last year, and could edge out Giovani Bernard for passing-down work at some point as well. Unfortunately for Mixon owners, I project this as a frustrating running back by committee situation for at least the first few weeks of the season. I’m not starting him until proven otherwise. Rookie tight ends – I get that Evan Engram is in a great spot against a Dallas defense that allowed the most fantasy points per game to opposing tight ends last year. With Odell Beckham Jr. questionable and Brandon Marshall banged up, I can envision a scenario where Engram sees a large workload this week. Still, he’s listed behind Rhett Ellison on the depth chart. The only rookie tight end listed as a starter on their team’s depth chart is O.J. Howard in their base (2TE) offense, and he’s not playing this week. Although 2017 could turn out to be the historic rookie class many are projecting, tight ends have always historically underperformed for fantasy in their rookie seasons. I’ll be taking a wait-and-see approach this early in the season. Patriots running backs (vs. KC) – The matchup appears good on paper for whichever running back assumes the LeGarrette Blount role this week, as the Patriots are favored by nine points at home. Unfortunately, I have absolutely zero idea who that might be. I’d rather take a wait-and-see approach this week. Kansas City allowed the 10th-fewest receiving fantasy points per game to opposing running backs, which – along with the massive (projected) positive gamescript – works against James White’s favor. I’m not starting any Patriots running back unless desperate.